I am a wire artist. I started my journey in January 2006, a year for new adventures. Our first adventure was to go diamond mining at the Herkimer Diamond Mines in New York. Herkimer Diamonds are double terminated quartz crystals. The most popular are the elongated crystals that can be wrapped in wire and made into a necklace. I went on line to search for instructions on how to wrap wire around a crystal and make it into a necklace. Preston Reuther became my mentor. Fortunately for me, I had a good job at the time and was able to buy all of the instructional DVDs he produced and all of his written material. The man is a true master wire sculptor. On more than one occasion, he said, “I’ll teach you the basics, but you will develop your own style.” At first I could not comprehend what he meant, but the more I work with wire the more I develop my own style that is just a little different or more advanced that what I did before. The first video was how to wrap cameos, like the one pictured with this post. I practiced and practiced. After a while, I had some that looked quite nice. I wore the cameos to see how they felt, how they hang, and how many compliments I would get from my fellow workers. To me the compliments were important. I didn’t want to produce a product that would not be well received by the public. As it turned out, personal test marketing was a blessing. Based on personal experience from designing my own jewelry since 1996, I know that the size of bail is important. Many times, my jeweler would bring back a finished piece and the chain would not fit through the bail. By making my own jewelry, that would hopefully never be the case. Brogan cameos have a long bail that can accommodate a one inch velvet ribbon, or an omega chain, a lace ribbon chain or a plain chain. One of the first cameos I wore came undone in the middle of the day. I was horrified! What if that happened to a customer? It was then and there I knew I would need to craft the bail in such a way that my customer’s would never have the same experience. The public’s reaction to cameos is interesting. Brogan cameos receive high praise for their beauty, their uniqueness, their reasonable price, and their quality guarantee. I am not a pushy sales person, but on occasion I have asked a potential customer if they would like me to package the cameo they fell in love with. They hesitate, with longing clearly showing in their face and decline, saying something about big beads as the in thing right now. 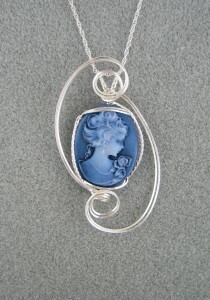 If I never sell another cameo, I will still create sculpted cameos to provide an art exhibit for my customers.